EnviroDEFENSE® D-Solv Clarifier is formulated to clarify brackish, murky pond water quickly. When used as directed pond water should clear and maintain a polished shine. EnviroDEFENSE® D-Solv Clarifier contains a strong formula to rapidly return pond water to its natural translucence and removes nuisance elements that cause murky water. EnvironDEFENSE® D-Solv Clarifier can be used on large lakes, small ponds, water features and even public fountains routinely to keep them clean and clear all year round. PRODUCT SPECIFICATIONS: EnviroDEFENSE® D-Solv Clarifier is a chemical and should be stored properly and precautions should be taken at all times for human safety. APPLICATIONS: EnviroDEFENSE® D-Solv Clarifier is used to clarify ponds and lakes. Using EnviroDEFENSE® D-Solv Clarifier as directed will clarify pond water, remove odor and maintain a healthy appearance. Initial Application: Apply 5 gallons (18.92 liters) of EnviroDEFENSE® D-Solv Clarifier for every acre foot of pond water. Routine Application: Apply 2 gallons (7.57 liters) of EnviroDEFENSE® D-Solv Clarifier for every acre foot of pond water every 30 days. PARAMETERS: When used in conjunction with or any bacteria additive, use in rotating doses. 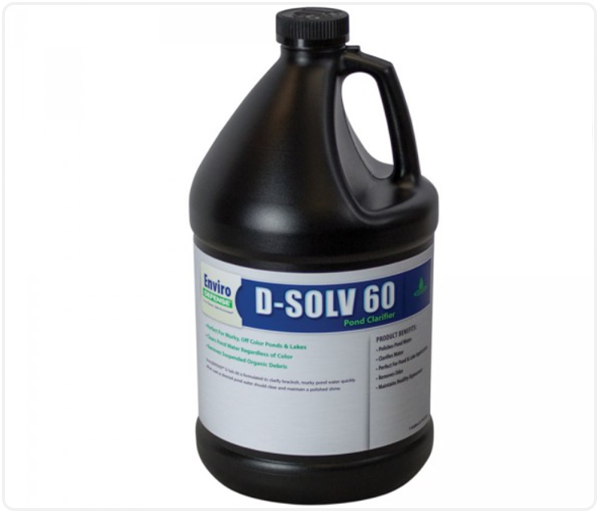 *D-Solv Clarifier is effective at both acid and alkaline pH. D-Solv Clarifier was applied a to 1/2 Acre Retention Pond with 5 foot depth in Inchon, South Korea. Pond clarity was determined in 24 hour intervals. After 72 hours, the pond had 5 feet of clarity and the bottom was clearly visible.